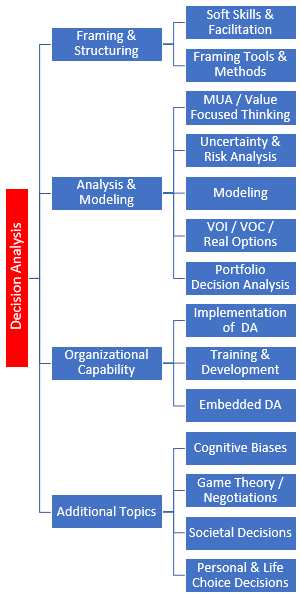 The DecisionPedia is a set of informational pages, organized as a hierarchy of decision analysis topics. Various information and resources are accessible within this structure, including SDP Library items such as webinars, conference presentations, and others. The intent is to use this format to continue adding to the body of knowledge available to members. The hierarchy allows the user to drill down into topical areas to see more detail or different sub-topics. The image at the left shows the top 3 levels of the hierarchy, and is "clickable". Note that this does not represent the entirety of the content - there are additional layers to the hierarchy that are available as you navigate down. As you navigate within a topic, we will provide a subset of Library and other resources that are relevant to that topic. The links below provide access to all of the Library resources, by resource type, and by application area.